NEED A CUSTOM SEED MIX? If you have your own specifications, just send the request via e-mail to support@vermontwildflowerfarm.com. Please provide the list of species desired and required percentages. If you don't have the appropriate percentages, we are happy to do those for you! We are also happy to design a custom mix just for your area! We have worked with hundreds of satisfied clients. Need something by color, height, soil conditions etc! We're on it! Turn around time is quick and pricing is fair. We do custom mixes on amounts as low as 1 Lb. No order is too big or too small! E-mail support@vermontwildflowerfarm.com and our experts will be happy to get going on the wildflower seed mix you need!! BUSINESS OR EVENTS of All Kinds! We’ve worked with many entities over the years like Hershey, ReMax, Departments of Tourism, Universities, Department Stores, Ancora, Best Buy, K-Mart and so many more creating custom packets for successful promotions and events. 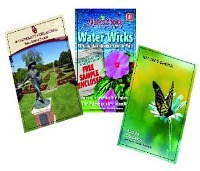 Why not join the trend and protect our environment by doing your part and create a custom seed packet for your promotion that is friendly to the environment and that will be given and not wasted or thrown away like other promotional items. We are simply just very good at what we do. We'll get you a quote within no time at all, usually same day! Our turnaround time is second to none. Create any kind of campaign and let us do the rest! You can do 1000 packets to literally millions! You call the shots, we get it done for you! - We Quickly Provide a Proof to Approve! - and Voila - We Print, Fill & Ship to you in NO Time at all! Types: Our Packets Come in Many Sizes but we suggest you use the standard size of 3 1/4" x 4 1/2"
Types of Seeds You Can Use: Wildflowers, Vegetables, Herbs or Let Us Know Something Special! Costs: Depends on Quantity - but pricing is super low compared to other companies!! Turnaround: Usually 7-10 Business Days from approved art Depending on seasonality (Weddings, Earth Day, Spring) turnaround times can be longer. Please check with us! FOR MORE INFORMATION - Call or E-mail Us Today!